When sprinkler systems are installed, it’s important for them to be discrete and well-protected, leading many social landlords to conceal, or ‘box in’, the associated pipework. Pre-formed pipe boxing offers a simple, neat solution that saves time and costs onsite while minimising tenant disruption, explains Lee Hall, National Sales Manager at Pendock. In the event of a fire, sprinkler systems are known to protect life and property. Controlling or extinguishing fires in 99% of cases, in the UK no one has ever died in a fire within a building fitted with working sprinklers. Widely recognised as the single most effective method for fighting the spread of fires in their early stages, sprinkler systems reduce injuries by at least 80% and property damage by 90%, while also substantially reducing damage to the environment from fire. Since 2007, the Building Regulations in England have stipulated that new high-rise residential buildings taller than 30 metres should have sprinklers fitted. These regulations are the same in Northern Ireland, but in Scotland the rules apply to residential buildings over 18 metres, and in Wales all new domestic premises must have sprinklers installed. However, nowhere in the UK is it a requirement to retrospectively fit sprinklers in existing buildings. Despite this, retrofit installations, particularly in existing high-rise social housing, have been on the increase, driven, understandably, by the Grenfell Tower disaster. 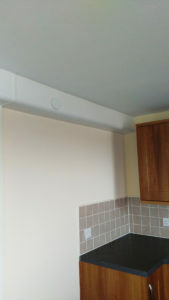 With a fire safety expert saying sprinklers would have stopped the fire from spreading and the Commissioner of the London Fire Brigade supporting retrofitting, the tragedy has led many local authority and housing association landlords to budget for the installation of sprinkler systems across their high-rise housing stock to help safeguard their tenants. And we can of course expect sprinkler installations to increase further if the associated Building Regulations are amended; the UK Government has said it intends to undertake a technical review of the Approved Document B (Fire safety), when possible changes to the guidance, including on the use of sprinklers, will be considered. But, while the benefits of retrofitting sprinkler systems might be well-understood, installations are not always met with immediate acceptance. Anecdotal evidence suggests that social housing landlords can face resistance, particularly in terms of aesthetics. 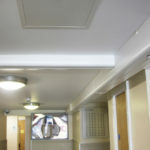 Retrofit sprinkler system installations generally involve fitting lengths of pipework along walls and ceilings within individual flats and communal areas, rather than the system being hidden within cavity spaces, as would be the case in new buildings. Exposed pipework can be unsightly, creating a barrier for landlords to overcome. Indeed, while many tenants welcome sprinkler systems, some have refused to have them fitted in their flats because they believe the unattractive pipework would have a detrimental impact on their homes. It’s essential for occupants to feel comfortable with a sprinkler system installation, and any concerns about aesthetics must be managed; for this reason, many landlords opt for the pipework to be concealed, or ‘boxed in’, providing a neater, more discrete look. This goes a long way towards ensuring the sprinkler system is unobtrusive and complements the existing décor, helping to alleviate any resistance. Boxing in also protects the system; accidental, or even deliberate, activation of sprinkler heads can have major consequences, including huge refurbishment costs. In addition, pipework can be a dust trap, and boxing in is much easier to keep clean and dust-free. However, boxing in can have an impact on installation timescales and costs, affecting budgets, and increasing disruption. This makes it crucial for landlords to choose an approach that will save time and money on site. Pre-formed pipe boxing provides a uniform finish and minimises tenant upheaval. Made to measure, it effectively covers lengths of sprinkler pipework running along ceilings and walls. It’s simple to fit and does not require painting, making it a cost-effective, quick solution. In fact, we estimate it takes half the time to fit pre-formed pipe boxing compared to onsite fabrication. City West Housing Trust has undertaken a far-reaching sprinkler system installation programme, involving 17 high-rise properties across greater Manchester. Pendock’s specialist pre-formed sprinkler system boxing is being fitted in both the public areas and individual flats within the buildings, which are up to 18-storeys high, neatly enclosing the sprinkler pipework and heads. The caps covering the sprinkler heads will fall off if the temperature rises to 68˚C, with water at 11 bar pressure being released to douse smoke and flames. Manufactured in Britain, the pipe boxing provides a flexible, adaptable, generic solution for any environment. It fits closely around typical circular sprinkler heads, and delivers a consistent, neat finish. 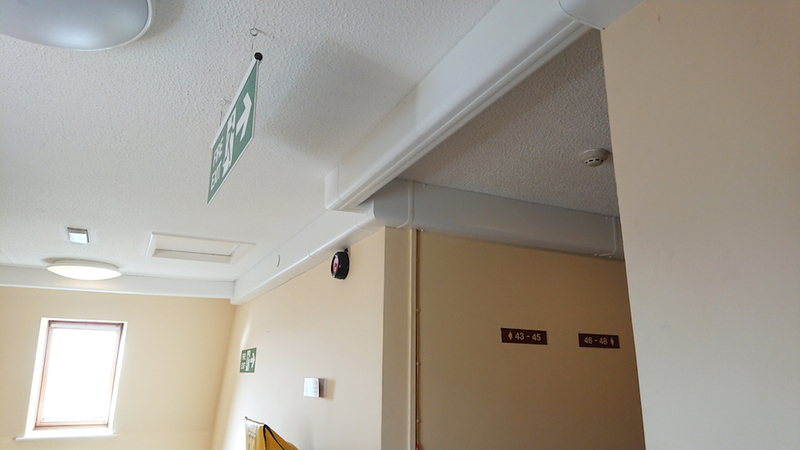 A range of accessories is available, including access panels and a bracket system that eliminates the removal of asbestos ceilings. We also offer site visits and assistance with overall project design. In response to the devastating consequences of the Grenfell Tower fire, retrofit domestic sprinkler installations have been increasing, particularly in high-rise social housing. While it is acknowledged that sprinkler systems protect lives and property, their aesthetic impact on existing homes still needs to be mitigated. Pre-formed pipe boxing is a simple, neat, cost-effective, quick solution that minimises tenant upheaval.